Will Goodman get out of Paradise alive? Never mind the departure of Peter Capaldi as Doctor Who, another high rated Beeb show is set for a changing of the guard. Tonight, we got a slight hint of the future for sun-soaked whodunnit Death in Paradise with the introduction of Ardal O’Hanlon as DI Jack Mooney. So the major question has to be - will Detective Inspector Humphrey Goodman get out of sunny Saint Marie alive? 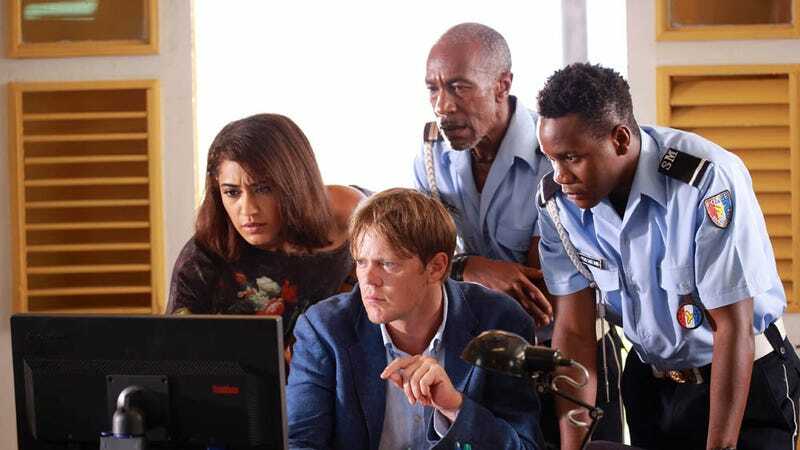 Kris Marshall’s hapless tec joined the Caribbean team after Ben Miller’s straight-laced Richard Poole was murdered at the start of season three. And of course, the whole thing started with Poole investigating the death of his predecessor. Can Humphrey really expect to get out with his skin intact? O’Hanlon will be in the remaining episodes of the current series before he steps into a deadman’s shoes takes the top role in the 2018 season. But has anyone told Mooney that the severance conditions leave a lot to be desired? Ardal O’Hanlon is the son of politician Rory O’Hanlon who was a health and environment minister in the Irish Government during the Eighties and early Nineties. Probably best known as Father Dougal McGuire in Channel 4's hit comedy Father Ted, he also played an alien superhero in the Beeb’s My Hero. He was also the voice of Aardman Animation’s Robbie the Reindeer.